Jon Lattergrass of Fargo is the latest big winner in the Free Poker Network, winning a $10,000 "Top Gun Poker Package" which included $5,000 of tournament buy-ins (WSOP), hotel/air, limo pickup, dinner and show tickets for 2, and $2,000 cash. It was Jon's first trip to Vegas and he made the most of it. 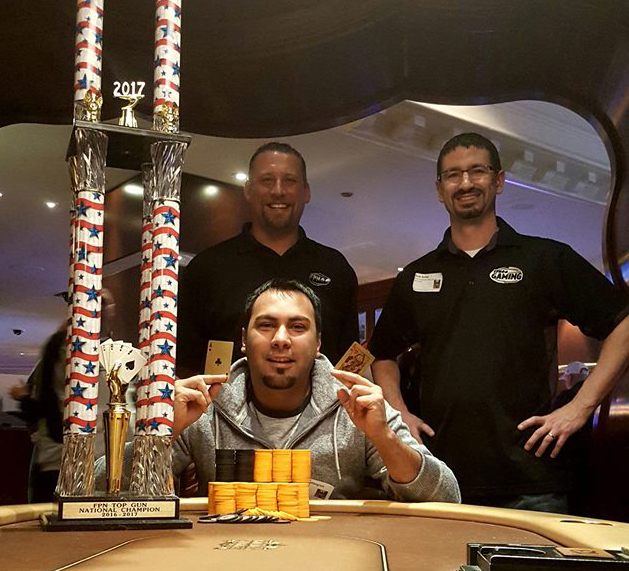 The final table was stacked with successful FPN players, including 2 previous nat'l champions. Jon earned his way to Vegas playing free poker nights at The Bowler. The weekend included several cash tournaments with overlays to the next league championship ("Colossus Poker Gods") coming up in June with a $10,000 main event seat up for grabs. The event was held at the Golden Nugget poker room, which was packed all weekend due to the influx of over 100 FPN players from around the country. LeAnn Wolff from Fargo, ND just missed out taking second place and scored her biggest ever casino tournament win with $800. Laurie Kasper from Glenville, MN qualified for the national championship by taking down the "Last Chance" tourney the night before and $1350 for first place. On Sunday for the 18 players that participated in the tournament with an overlay of not only the regular casino payouts, but the longest lasting FPN player qualifying for the upcoming Nationals we had a great showing. Tanya Rausis almost bubbled again, but made it into the money winning $125. Both Larry Sundberg and Glenn Schaefers cashed $220. Chad Kolloen hit $440, Stephan Oberlander made $660, Doug Behrens $770, Marjorie Passaro $1100. The longest lasting FPN player was Richard Sathre getting 3rd place for $1320 and now has a trip to plan for the next Nationals on June 2nd or 3rd.